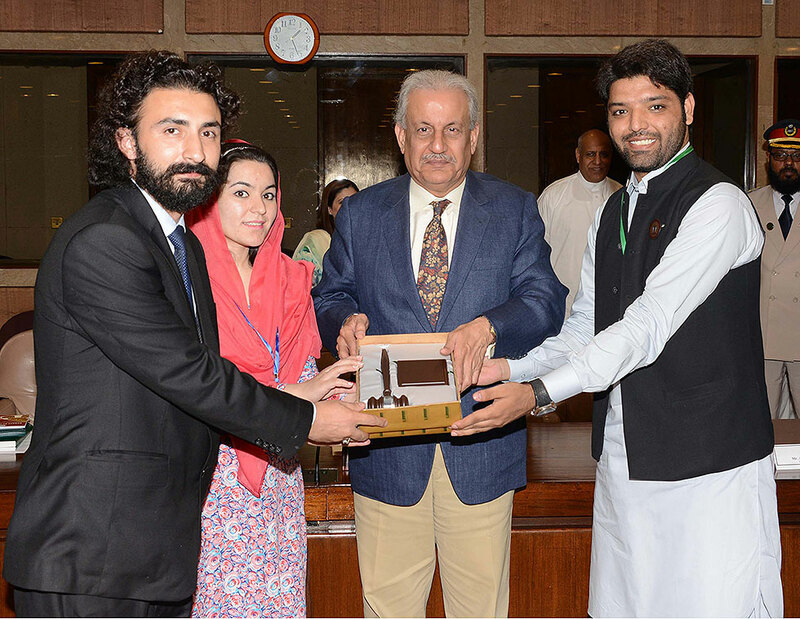 July 31, Islamabad; Members of the first session of 7th Youth Parliament Pakistan called upon Honourable Senator Mian Raza Rabbani, Chairman Senate of Pakistan, at the Parliament House today. Welcoming the Members of Youth Parliament Pakistan, Senator Rabbani said it has always been a pleasure for him to address the previous batches at the Youth Parliament venue; it was, however, an equal pleasure to welcome the new batch to the Parliament House. Senator Rabbani addressed key questions of the MYPs in detail with the broad message that as the future of Pakistan, youth must guard against undemocratic tendencies and threats to democracy. Addressing a question raised by the Members of the Youth Parliament regarding proceedings of the Parliament to be televised live, Senator Rabbani said that he favoured the concept as lack of access and communication between the Parliament and people has led to a sense of alienation between the two. Answering another question regarding the necessity of the 21st Constitutional Amendment, he said that while he acknowledges the extraordinary security threats facing the country, the route of 21st Constitutional Amendment is not the most favourable to address the problem. Without necessary reforms in the prosecution processes, the challenge would remain. Accepting a proposal by PILDAT to lead the efforts from the platform of Parliament to develop a set of reform proposals to strengthen rule of law, he believed that political will is required to address our challenges in a holistic, long-term perspective. Earlier, Ms. Aasiya Riaz, Joint Director PILDAT, thanked the Honourable Chairman for receiving the members of 7th batch of Youth Parliament Pakistan. She said that PILDAT admires his activism in asserting parliamentary authority over the executive. Mr. Amjed Pervez Malik, Secretary, Senate of Pakistan and Ms. Rabeea Anwar, Deputy Secretary Legislation were also part of the meeting. During the 3rd day of the first session of the Youth Parliament, Members of the Youth Parliament Pakistan received training on the modules of National Security & Civil-Military Relations, Quality of Governance and Energy Crisis in Pakistan. While Dr. Hasan Askari Rizvi, Defence and Political Analyst shared perspectives on internal and external security threats facing Pakistan, eminent Development & Political Economist, Dr. Niaz Murtaza briefed the members on assessment of quality of governance. Later in the evening, Dr. Gulfaraz Ahmed, Former Secretary Petroleum, gave an extensive and comprehensive presentation on the Energy Crisis in Pakistan. The Youth Parliament Pakistan is an initiative conceived, planned and facilitated by PILDAT. The 7th Youth Parliament Pakistan is supported by the Danish International Development Agency, Government of Denmark as recognition of the importance of young people’s involvement in democracy and democratic practices.